Chichicastenango; ¿Por Que Sera? ; Mi Lorena Linda; Cobán; Recuerdos De Un Amigo; Los Trece; Lágrimas De Thelma; Linda Morena; Ferrocarril De Los Altos; Luna De Xelajú; Juventud Antiguena; San Francisco De Asis; Soy De Zacapa; Rio Polochic; Noches De Escuintla; Migdalia Azucena; Noche De Luna En Las Ruinas; Tristezas Quetzaltecas; Bella Guatemala. While the Marimba can be heard throughout Central America, in Guatemala, Congress declared it a national instrument, thus underlining its central place in the cultural, social and emotional life of Guatemalans. The instrument’s roots can be traced back to as early as 1680 during the early years of Spanish colonization. Most historians agree that the Marimba is essentially a copy of a West African instrument brought over with slaves in the 16th Century which subsequently took on a life of its own through the practices and traditions of the indigenous Mayan population. They, in turn, adopted the tuning of the diatonic scale prevalent in their colonizer’s music thus blending the influences of three cultures into this one unique instrument. The Marimba Chapinlandia, who feature on this CD, perform a modern marimba sound which developed at the beginning of the 20th Century. A modern marimba band consists of the marimba grande and the marimba tenor in addition to a drum kit, percussion and occasionally a horn section often doubled on by the marimba musicians themselves. While the music is predominantly social, accompanying weddings, baptisms, festivals, etc., the repertoire has also been cultivated to concert hall status and is often adapted to Western musical conventions and performed in salon dances. 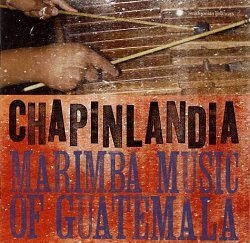 As exemplars of modern marimba performance, the Marimba Chapinlandia have showcased the entire range of playing styles on this CD with the explicit purpose of safeguarding the tradition from foreign popular traditions. The CD works well both as an introduction to marimba music and as a ’best of...’ for aficionados. It contains some joyful renditions of popular favourites such as Mi Lorena linda (My Pretty Lorena) and the waltz Recuerdos de un amigo (Memories of a Friend) and includes the unofficial Guatelman anthem Luna de Xelajý (Moon of Xelajý).